Joe Schmidt’s men showed signs that they had prepared themselves for the Welsh defensive tactics. 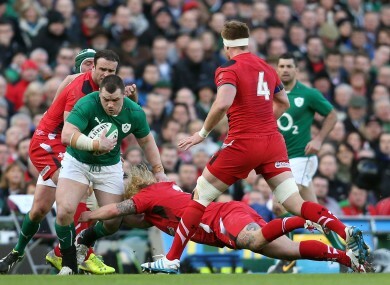 Richard Hibbard goes in low on Ireland's Cian Healy. THE CHOP TACKLE is to rugby today what the ‘choke’ tackle was in 2011. We’re exaggerating of course, but there is little doubt that many teams have thrived from a renewed focus on low tackling in the last two years or so. Wales have been particularly effective in their use of the chop tackle during their back-to-back Six Nations triumphs, allowing them to make multiple turnovers and stifle the opposition’s attacking plans. Dan Lydiate has been superb in this area, getting himself incredibly low and taking out ball carriers at the ankle. That brings the attacking player to the deck swiftly and allows other defensive players to pounce for turnovers in the split second it takes the supporting attackers to react. However, that element of surprise is starting to wane and last weekend, Ireland gave us a fine example of how to beat Wales at what has been their own game in recent seasons. Leinster take on the Dragons in the Pro12 tomorrow and, coincidentally, the Welsh region are an excellent chop tackling team. Lyn Jones’ men win plenty of turnovers by ‘jackaling’ immediately after chop tackles and it’s something Leinster will have taken a detailed look at this week. For those unsure on what jackaling is, it's what Peter O'Mahony has been doing lots of for Ireland in recent weeks. Speaking to TheScore.ie yesterday, Matt O’Connor succinctly explained that counteracting the ‘chop and jackal’ is not rocket science. Ireland’s kicking game [which we will take a detailed look at in a separate piece later] against Wales last weekend was about far, far more than avoiding the chop tackle. However, the fact that Conor Murray and Jonny Sexton kicked the ball so often meant that they were fewer opportunities for Wales to employ one of their favourite defensive tactics. It’s impossible to say this with certainty, but had Ireland run more of their possession at Wales’ powerful front-line defence, we would likely have seen more use of the chop tackle and, subsequently, more turnover opportunities. As mentioned above, Joe Schmidt’s plan to kick in behind was about exploiting weaknesses as well as avoiding strengths, but the fact is that Wales were not able to employ their low-tackling and jackaling skills as often as they would have liked. Of course, Ireland didn’t kick away every bit of possession they had and there were occasions on which Wales had the chance to do what they [up until now] do best. But Ireland were ready for the chop tackle, they were expecting it. Little details make a huge difference in rugby, and putting on a little bit of footwork before taking contact can be hugely decisive in deciding whether the outcome will be positive for the attacking team. There is a time and place for seeking out bodies to smash into, but not against Wales. Schmidt made his men aware that the chop tackle was coming, and as a result we saw them taking small measures to reduce it’s effectiveness. The example from Gordon D’Arcy below gives us a good starting point. As Ireland’s inside centre carries the ball, you can see that Mike Phillips and Sam Warburton are lining up to tackle him. The scenario they envisage is a low chop tackle from the openside flanker, followed by Phillips getting in to compete for the turnover swiftly. When we freeze the frame [below], it’s apparent that D’Arcy is just a tiny bit isolated. You can see that Warburton has got his upper body extremely low and his legs are ready to explode forward; he’s lining up that driving chop tackle around D’Arcy’s ankles. What happens next is essential. D’Arcy just turns on that habitually excellent footwork of his, and just forces Warburton to hesitate for a split second. That’s all Ireland need to get their supporting players to the contact situation and Wales are thwarted. There were other examples of similar stuff throughout the game, but we’ll use an example from the second half to illustrate the frustration Wales were starting to feel. This time it’s Peter O’Mahony who avoids the first-up chop tackle by using some decent footwork. It’s a very similar situation, with Ireland’s ball carrier taking a pass from scrum-half Murray to carry relatively close to the preceding ruck. This time O’Mahony steps inside to avoid the immediate chop tackle and allow his support to arrive. Again, when we freeze the video [below] it’s obvious how low the prospective chopper [Andrew Coombs] is going into the tackle. The Dragons second row is actually down on his knees as he plans to cut O’Mahony’s ankles from underneath him in the tackle. That little shift from O’Mahony makes all the difference in not getting scythed down behind the gainline and allows Rory Best and Dan Tuohy to just about prevent Gethin Jenkins from getting into that jackal position. The Cardiff Blues prop is usually a real menace at the breakdown, but gives away a penalty in frustration here. Incidentally, this is where Tuohy [wearing 19] fractures his right forearm, and you can actually pinpoint the moment in the video above. There weren’t many examples of the dream duo of Lydiate and Warburton linking up defensively against Ireland. The back row pair have combined extremely effectively in the past, with Lydiate chopping attackers down and Warburton poaching the ball. The only example of their efforts to do that against Ireland is the one below, in the first half as Schmidt’s men looked to attack with ball in hand. First things first, it’s not an especially good chop tackle by Lydiate. There is a lack of impact, a little absence of accuracy in not bringing Jamie Heaslip straight to deck. Lydiate’s best tackles bring the ball carrier to deck immediately, but here the No. 8 has a brief chance to shoulder Warburton away from the ball. Schmidt admitted afterwards that the poor form of Lydiate and the lack of match fitness of Warburton had a telling effect on this game; something that is certainly easy to agree with. Still, looking beyond those Welsh deficiencies here, it’s obvious that Ireland’s supporting players are doing their jobs with precision. In the example above, Rob Kearney and Jonny Sexton [two men not generally lauded for their rucking] are alert and ready to clear out the threat. They know Warburton will go for that poach and they clear him out as quickly as possible. Below, we see Lydiate carry out a stronger tackle on Devin Toner [a better target for the chop] and again, Ireland’s supporting players are straight to the ruck in support. Paul O’Connell and Mike Ross, as well as O’Mahony, ensure that Alun-Wyn Jones gets nowhere near entering jackaling territory. Encouragingly, this was both a recognition of Wales’ strengths and an improvement on the performance against Scotland. That first round fixture saw Ireland failing to commit enough supporting players to the breakdown in the first half and, as a result, the Scots managed to cause some problems in that area. As we’re all aware, it was Ireland who had by far the better of the breakdown turnover battle, with O’Mahony standing out in this area. Unsurprisingly, much of the best work from Ireland at the breakdown came following low tackles close to the preceding ruck. Paul O’Connell has mentioned before that he actually asked Lydiate for one-on-one tackling coaching while the pair were on the 2013 Lions tour. We’ve seen a renewed focus on low tackling in Ireland in the last two years, particularly from our forwards and centres. Last weekend, the warning shots were fired early by Schmidt’s men, but Wales failed to heed them. The example below comes in the opening minutes of the game. Clearly, there’s no turnover in the example above after Best’s tackle, but you can see that both O’Mahony and O’Connell get a glance of the ball before being efficiently cleared out. It’s good work from Wales to ensure quick ball, but they just didn’t keep that standard up. Perhaps the most important turnover from O’Mahony was the one in the 48th minute [below], when Wales were fighting hard to get back into a game that was not yet lost. Warburton initially does well to avoid a dominant chop tackle from Cian Healy, stepping inside the tackler as we saw O’Mahony doing earlier. However, the crucial thing is that the support just doesn’t follow. Lydiate gets tripped up [almost symbolically of how the game went for him], and then the similarly off-colour Adam Jones watches O’Mahony getting into that jackal position. The tighthead prop actually stands still [below] for a split-second before reacting to the situation. Wales simply didn’t have supporting players at the breakdown early enough to ‘move blokes out of the ruck’ as they had done at the very start of the game. The above was not an isolated incident, more an example of what happened in a more general sense. Adding to Wales’ lethargy and lack of focus, was Ireland having completely the opposite mindset. They had fit, hungry and prepared players on the pitch, ready for what Schmidt had told them would unfold. The GIF below gives us an example of that. This time it’s a pair of Ireland replacements who are at the core of the turnover, with Sean Cronin making the low tackle and Tommy O’Donnell pouncing into the jackal position. Realistically, the breakdown situation above is a one-on-one between the arriving O’Donnell and Wales’ first man on scene, Warburton. It’s the Munster flanker who wins though, thanks to his rapid reaction speed. The 26-year-old is fit, fresh, prepared, and proactive, while Warburton is not fully fit, slightly sluggish and reactive in his actions. A brief snippet like the one above offers a microcosm of how the game unfolded as a whole. Chop tackling is not a fail-safe defensive technique, despite how effective it is when done well. Referees are beginning to demand a clear wrap of the arms in low tackles, even when the defender is moving forward in a dominant style. As you can imagine, a 110kg back row diving forward into the knees or shin bones of a planted leg has potential for disaster, so it is encouraging to see match officials looking to cut it out. On top of that, the chop tackle is difficult to pull off. It requires bravery and accuracy to go in low on a moving target and bring them to a halt. The traditional tackling technique taught to children is of course much safer for the defender, with a premium put on that ‘cheek to cheek’ objective when tackling further up the legs. However, for professional players often unconcerned about their own safety, rolling away after completing the chop tackle can be more of a worry. Again, we got an example of that last weekend. As you can see above, Lydiate dives in low and takes O’Connell just below the knee, stopping his run immediately. However, the Ireland second row lands almost on top of them and then Ireland’s swift support [Kearney and Sexton again] traps Lydiate. The result is a penalty for the home side, which allows them to open the score in this particular game. If you’re going to chop, you’ve got to be accurate and Wales just weren’t against Ireland. It will be fascinating to follow the chop tackle throughout the remainder of the Six Nations as each team varies their focus and effectiveness in this area. Will Wales get back to their best form with the chop and jackal? Can Lydiate and Warburton link up again to steal opposition possession? How will England deal with Ireland’s turnover threat at the breakdown following low tackles? Can Ireland keep committing support players to clearing the rucks if they attempt to attack more ambitiously with ball in hand? We’ll be keeping a close eye on the chop. Email “Analysis: Ireland win the battle of the chop tackle to stifle Wales”. Feedback on “Analysis: Ireland win the battle of the chop tackle to stifle Wales”.